Infrared heat is an excellent non-contact heat source and is thus used in applications involving delicate surfaces, for pre-heating, softening, curing and drying. gasses from solvents or steam can be freely extracted without loss of energy. 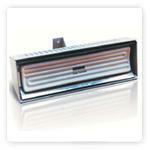 contact us to discuss Ceramic- infrared heating requirements. Heating by means of infrared radiation is natural & simple, non-contact & rapid heat-up. Large amounts of energy can be transferred in a short time. But it also means gentle heating, as the radiation penetrates into the object being heated and doesn't just act on the surface. Infrared emitters can be controlled quickly and precisely. Heating is targeted, can be localised and is switched on and off by the push of a button. Ceramic infrared elements emit in the medium- to long wave spectrum, producing a gentle and even heat. 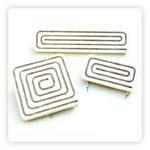 Ceramic infrared emitters are robust and durable. They are available in various standard sizes and power ratings. This modular approach allows arrangement of elements in a heating array providing an even heat profile over the whole target area. 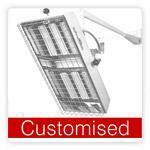 Elements in the array can be mounted at different heights to cater for uneven surfaces. Ceramic infrared emitters can be supplied with integrated thermocouple, allowing precise measurement and control of heating power. Contact us to discuss your specific Ceramic Infrared Heating Requirements or view our standard stock items below & request a quote! .